When things go wrong, space gives you time to think and to take action. Distracted Driving: Whenever you are driving a vehicle and your attention is not on the road, you are putting yourself, your passengers, other vehicles, and pedestrians in danger. Hazardous Conditions:You are at greater risk when you drive at night. Drivers cannot see hazards as quickly as in daylight, so they have less time to respond. Recognizing Hazards:You will have more time to act if you see hazards before they become emergencies. 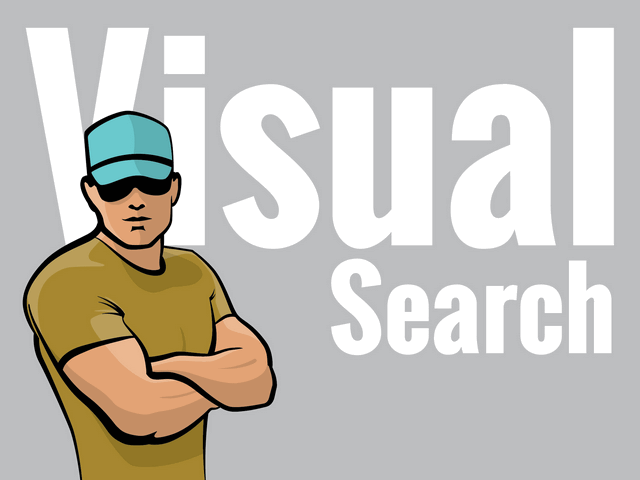 Visual Search:You need to the ability to recognize other drivers who are engaged in any form of driving distraction. Whenever you are driving a vehicle and your atten-tion is not on the road, you are putting yourself, your passengers, other vehicles, and pedestrians in danger. You are at greater risk when you drive at night. Drivers cannot see hazards as quickly as in day-light, so they have less time to respond. Drivers caught by surprise are less able to avoid a crash. What is a hazard? A hazard is any road condition or other road user, including pedestrians and animals, that presents a potential danger to safe operation. So, a hazard is a potential problem and an emergency is an actual danger. Recognition of a hazard before it becomes an emergency allows you to respond early. You will have more time to act if you see hazards before they become emergencies. In the example above, you might make a lane change or slow down to prevent a crash if the car suddenly cuts in front of you. Question 01. You are driving at 50 foot vehicle at 50 mph. How much following distance should you have? Question 02. You need to manage the space all around your vehicle so you can ______________. have space available when something goes wrong. Make a sudden lane change in an emergency. "have space available when something goes wrong." Make better time on your trip. Question 03. A heavy vehicle should always drive in the _____________lane. Question 04. Which of these statements about hazards is true? A hazard is an accident waiting to happen. "You will have more time to act if you see hazards before they become emergences." Hazards are mainly created by the weather. You will have more time to act if you see hazards before they become emergences. Question 05. 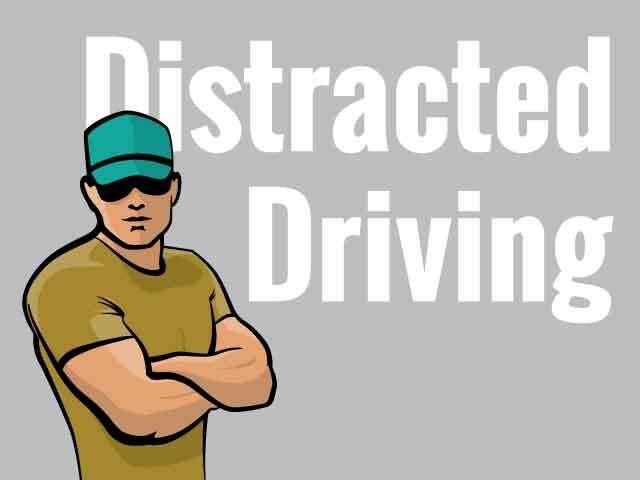 Which of the following best describes distracted driving? Distracted driving can result when you perform any activity that may shift you attention from the driving task. "Distracted driving can result when you perform any activity that may shift you attention from the driving task. " Some drivers may feel your commercial vehicle is preventing them from getting where they are going. Such drivers may pass you without a safe gap in the oncoming traffic. Question 06. Which of the following is the best choice when confronted with an aggressive driver? "Make every attempt to get out of their way"
Slow your vehicle down to make it easier for them to get around you. Question 07. When should you use your high beams? "Whenever it is safe to do so"
Question 08. What should you do if you become sleepy while driving? "Stop driving at the nearest safe place"
"The brakes to become weak, to apply unevenly, or to grab." The brakes to become weak, to apply unevenly, or to grab. Question 10. Which of the following statements about the radiator cap is true? Never remove the radiator cap or any other part of the pressurized system until the system has cooled. "Never remove the radiator cap or any other part of the pressurized system until the system has cooled. " To be a safe driver, you need space all around your vehicle. When things go wrong, space gives you time to think and to take action. 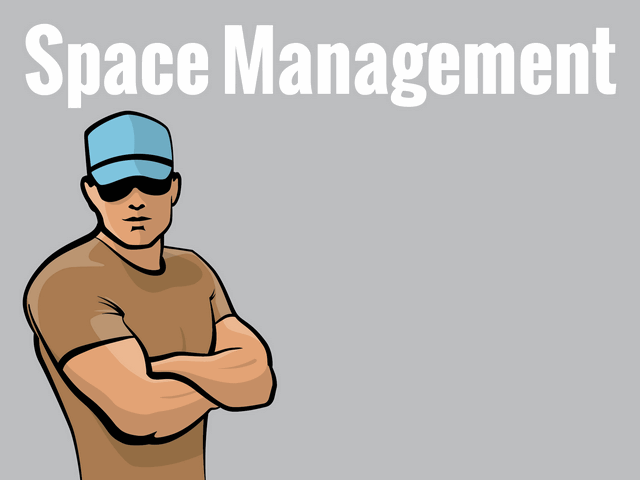 To have space available when something goes wrong, you need to manage space. While this is true for all drivers, it is very important for large vehicles. They take up more space, and they require more space for stopping and turning. You need space ahead in case you must suddenly stop. According to accident reports, the vehicle that trucks and buses most often run into is the one in front of them. The most frequent cause is following too closely. Remember, if the vehicle ahead of you is smaller than yours, it can probably stop faster than you can. You may crash if you're following too closely. How much space should you keep in front of you? One good rule says you need at last 1 second for each 10 feet of vehicle length at speeds below 40 miles per hour. At greater speeds, you must add one second for safety. For example, if you're driving a 40-foot vehicle, you should leave 4 seconds between you and the vehicle ahead. In a 60-foot rig, you will need 6 seconds. Over 40 miles per hour, you would need 5 seconds for a 40-foot vehicle and 7 seconds for a 60-foot vehicle. To know how much space you have, wait until the vehicle ahead passes a shadow on the road, a pavement marking, or some other clear landmark. Then count off the seconds like this, "1,001, 1,002," and so on, until you reach the same spot. Compare your count with the rule of 1 second for every 10 feet of length. If you're driving a 40-foot truck and only counted up to 2 seconds, you're too close. Drop back a little and count again until you have 4 seconds of following distance, or 5 seconds if you're going over 40 miles per hour. After a little practice, you'll know how far back you should be. Remember to add 1 second for speeds above 40 miles per hour. Also, remember that when the road is slippery, you need much more space to stop. You cannot stop others from following you too closely, but there are things you can do to make it safer. Stay to the right. Heavy vehicles are often tailgated when they cannot keep up with the speed of the traffic. This often happens when you're going uphill. If a heavy load is slowing you down, stay in the right lane if you can. Going uphill, you should not pass another slow vehicle unless you can get around quickly and safely. Dealing with tailgaters safely. In a large vehicle, it is often hard to see whether a vehicle is close behind you. You may be tailgated. If you find yourself being tailgated, here are some things you can do to reduce the chances of a crash. Avoid quick changes. If you have to slow down or turn, signal early and reduce speed very gradually. Increase your following distance. Opening up room in front of you will help you to avoid having to make sudden speed or direction changes. It also makes it easier for the tailgater to get around you. Do not speed up. It is safer to be tailgated at a low speed than a high speed. Avoid tricks. Do not turn on your taillights or flash your brake lights. Follow the suggestions above. Commercial vehicles are often wide and take up most of a lane. Safe drivers will manage what little space they have. You can do this by keeping your vehicle centered in your lane, and avoid driving alongside others. Staying centered in a lane. You need to keep your vehicle centered in the lane to keep safe clearance on either side. If your vehicle is wide, you have little room to spare. Traveling next to others. There are two dangers in traveling alongside other vehicles. Another driver may change lanes suddenly and turn into you. You may be trapped when you need to change lanes. Find an open spot where you're not near other traffic. When traffic is heavy, it may be hard to find an open spot. If you must travel near other vehicles, try to keep as much space as possible between you and them. Also, drop back and pull forward so that you're sure the other driver can see you. Strong winds. Strong winds make it difficult to stay in your lane. The problem is usually worse for lighter vehicles. This problem can be especially bad coming out of tunnels. Do not drive alongside others if you can avoid it. Hitting overhead objects is a danger. Make sure you always have overhead clearance. Do not assume that the heights posted at bridges and overpasses are correct. Repaving or packed snow may have reduced the clearances since the heights were posted. The weight of a cargo van changes its height. An empty van is higher than a loaded one. That you got under a bridge when you were loaded does not mean that you can do it when you are empty. If you doubt you have safe space to pass under an object, go slowly. If you're not sure you can make it, take another route. Warnings are often posted on low bridges or underpasses, but sometimes they are not. Some roads can cause a vehicle to tilt. There can be a problem clearing objects along the edge of the road, such as signs, trees, or bridge supports. Where this is a problem, drive a little closer to the center of the road. Before you back into an area, get out and check the overhanging objects, such as trees, branches, or electric wires. It is easy to miss seeing them while you're backing. Also, check for other hazards at the same time. Many drivers forget about the space under their vehicles. That space can be very small when a vehicle is heavily loaded. This is often a problem on dirt roads and in unpaved yards. Do not take a chance on getting hung up. Drainage channels across roads can cause the ends of some vehicles to drag. Cross such depressions carefully. Railroad tracks can also cause problems, particularly when pulling trailers with a low underneath clearance. Do not take a chance on getting hung up halfway across. The space around a truck or bus is important in turns. Because of wide turning and off-tracking, large vehicles can hit other vehicles or objects during turns. Right turns. Here are some rules to help prevent a right-turn crash. Turn slowly to give yourself and others more time to avoid problems. If you are driving a truck or bus that cannot make the right side without swinging it into another lane, turn wide as you complete the turn. Keep the rear of your vehicle close to the curb. This will stop other drivers from passing you on the right. Do not turn wide to the left as you start the turn. A following driver may think you are turning left and try to pass you on the right. You may crash into the other vehicle as you complete your turn. If you must cross into the oncoming lane to make a turn, watch out for vehicles coming toward you. Give them room to go by or to stop. However, do not back up for them, because you might hit someone behind you. See figure 2.13. On a left turn, make sure you have reached the center of the intersection before you start the left turn. If you turn too soon, the left side of your vehicle may hit another vehicle because of off-tracking. If there are two turning lanes, always take the right turn lane. Do not start in the inside lane, because you may have to swing right to make the turn. Drivers on your left can be far more readily seen. Be aware of the size and weight of your vehicle when you cross or enter traffic. Here are some important things to keep in mind. Because of slow acceleration and the space large vehicles require, you may need a much larger gap to enter traffic than you would in a car. Acceleration varies with the load. Allow more room if your vehicle is heavily loaded. Before you start to cross a road, make sure you can get all the way across before traffic reaches you. What is a hazard? A hazard is any road condition or other road user, driver, bicyclist, pedestrian, that is a possible danger. For example, a car in front of you is headed toward the freeway exit, but his brake lights come on and he begins braking hard. This could mean that the driver is uncertain about taking the off-ramp. He might suddenly return to the highway. This car is a hazard. If the driver of the car cuts in front of you, it is no longer just a hazard. It is an emergency. Seeing hazards let you be prepared. You will have more time to act if you see hazards before they become emergencies. You might make a lane change or slow down to prevent a crash if a car suddenly cuts in front of you. Seeing this hazard gives you time to check your mirrors and signal a lane change. Being prepared reduces the danger. A driver who did not see the hazard in front of him would have to do something very suddenly. Sudden braking or a quick lane change is much more likely to lead to a crash. 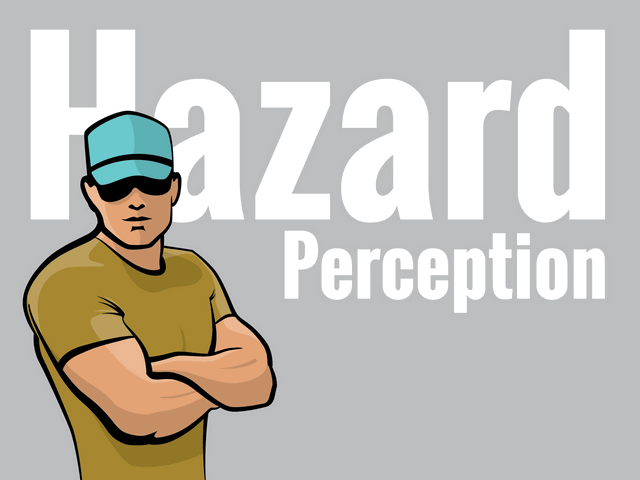 There are often clues that will help you see hazards. The more you drive, the better you can learn to see hazards. This section will talk about hazards you should be aware of. Hazardous roads. Slow down and be very careful if you see any of the following road hazards. Work zones. When people are working on the road, it is a hazard. There may be narrower lanes, sharp turns or uneven surfaces. Other drivers are often distracted and drive unsafely. Workers and construction vehicles may get in the way. Drive slowly and carefully near work zones. Use your four-way flashers or brake lights to warn drivers behind you. Drop-off. Sometimes the pavement drops off sharply near the edge of the road. Driving too near the edge can tilt your vehicle toward the side of the road. This can cause the top of your vehicle to hit roadside objects, signs, tree limbs. Also, it can be hard to steer as you cross the drop-off going off the road or coming back on. Foreign objects. Things that have fallen on the road can be hazards. They can be a danger to your tires and wheel rims. They can damage electrical and brake lines. They can be caught between dual tires and cause severe damage. Some obstacles that appear to be harmless can be very dangerous. For example, cardboard boxes may be empty, but they may also contain some solid or heavy material capable of causing damage. The same is true of paper and cloth sacks. It is important to remain alert for objects of all sorts, so you can see them early enough to avoid them without making sudden, unsafe moves. Freeway and turnpike exits can be particularly dangerous for commercial vehicles. Off-ramps and on-ramps often have speed limit signs posted. Remember, these speeds may be safe for automobiles, but may not be safe for larger vehicles or heavy-loaded vehicles. Exits that go downhill and turn at the same time can be especially dangerous. The downgrade makes it difficult to reduce speed. Braking and turning at the same time can be a dangerous practice. Make sure you are going slowly enough before you get on a curve part of an off-ramp or on-ramp. In order to protect yourself and others, you must know when other drivers may do something hazardous. Some clues to this type of hazard are blocked vision. People who cannot see others are a very dangerous hazard. Be alert for drivers whose vision is blocked. Vans, loaded station wagons, and cars with the rear window blocked are examples. Rental trucks should be watched very carefully. Their drivers are often not used to the limited vision they have to the sides and rear of the truck. In winter, vehicles with frosted, ice-covered, or snow-covered windows are hazards. Vehicles may be partly hidden by blind intersections or alleys. If you only can see the rear or front end of the vehicle but not the driver, then he or she cannot see you. Be alert because he or she may back out or enter into your lane. Always be prepared to stop. Delivery trucks can present a hazard. Packages or vehicles doors often block the driver's vision. Drivers of step vans, postal vehicles, and local delivery vehicles are often in a hurry and may suddenly step out of their vehicle or drive their vehicle into the traffic lane. Slow drivers. Motorists who fail to maintain normal speed are hazards. Seeing slow-moving vehicles early can prevent a crash. Some vehicles by their nature are slow, and seeing them is a hazard clue, mopeds, farm machinery, construction machinery, tractors, etc. Some of these will have the "slow-moving vehicle" symbol to warn you. This is a red triangle with an orange center. Watch for it. Drivers in a hurry. Drivers may feel your commercial vehicle is preventing them from getting where they want to go on time. Such drivers may pass you without a safe gap into oncoming traffic, cutting too close in front of you. Drivers entering the road may pull in front of you in order to avoid being stuck behind you, causing you to brake. Be aware of this and watch for drivers who are in a hurry. Impaired drivers. Drivers who are sleepy, have had too much to drink, are on drugs, or who are ill are hazards. Some clues to these drivers are weaving across the road or drifting from one side to another, leaving the road, dropping right wheels onto the shoulder or bumping across the curb in a turn. Stopping at the wrong time, stopping at a green light, or waiting too long at the stop, open window in cold weather, and speeding up or slowing down suddenly, driving too fast or too slow. Be alert for drunk drivers and sleepy drivers late at night. Driver body movement as a clue. Drivers look in the direction they're going to turn. You may get a clue from a driver's head and body movements that a driver may be going to make a turn, even though the turn signals are not on. Drivers making over-the-shoulder checks may be going to change lanes. These clues are most easily seen in motorcyclists and bicyclists. Watch other road users and try to tell whether they might be doing something hazardous. Parked vehicles can be hazards, especially when people start to get out of them. Or they may suddenly start up and drive into your way. Watch for movement inside the vehicle, or movement of the vehicle itself that shows people are inside. Watch for brake lights or backup lights, exhaust, and other clues that a driver is about to move. Be careful of a stopped bus. Passengers may cross in front of or behind the bus, and they often cannot see you. Pedestrians and bicyclists can also be hazards. Walkers, joggers, and bicyclists may be on the road with their back to the traffic, so they cannot see you. Sometimes they wear portable stereos with headsets, so they cannot hear you either. This can be very dangerous. On rainy days, pedestrians may not see you because of hats or umbrellas. They may be hurrying to get out of the rain and may not pay attention to the traffic. Distractions. People who are distracted are hazards. Watch for where they are looking. If they are looking elsewhere, they cannot see you. But be alert, even when they are looking at you. They may believe that they have the right of way. Children. Children tend to act quickly without checking traffic. Children playing with one another may not look for traffic and are a serious hazard. Talkers. Drivers or pedestrians talking to one another may not be paying close attention to the traffic. Workers. People working on or near the roadway are a hazard clue. The work creates a distraction for other drivers, and the workers themselves may not see you. Ice cream trucks. Someone selling ice cream is a hazard clue. Children may be nearby and may not see you. Disabled vehicles. Drivers changing a tire or fixing an engine often do not pay attention to the danger that roadway traffic is to them. They are often careless. Jacked up wheels or raised hoods are hazard clues. Crashes. Crashes are particularly hazardous. People involved in the crashes may not look for traffic. Passing drivers tend to look at the crashes. People often run across the road without looking. Vehicles may slow or stop suddenly. Shoppers. People in and around shopping areas are often not watching traffic because they are looking for stores or looking in store windows. Confused drivers. Confused drivers often change direction suddenly or stop without warning. Confusion is common near freeway or turnpike interchanges and major intersections. Tourists unfamiliar with the area can be very hazardous. Clues to the tourists include car-top luggage and out-of-state license plates. Unexpected actions, stopping in the middle of a block, changing lanes for no apparent reason, backup lights suddenly going on are clues to confusion. Hesitation is another clue, including driving very slowly, using brakes often, or stopping in the middle of an intersection. You may also see drivers who are looking at street signs, maps, and house numbers. These drivers may not be paying attention to you. You are in conflict when you have to change speed and/or direction to avoid hitting someone. Conflicts occur at intersections where vehicles meet, at merges such as turnpike on-ramps, and where there are needed lane changes such as the end of a lane, forcing a move to another lane of traffic. Other situations include slow-moving or stalled traffic in a traffic lane and accident scenes. Watch for other drivers who are in conflict, because they are a hazard to you. When they react to this conflict, they may do something that will pull them in conflict with you. Always look for hazards. Continue to learn to see hazards on the road. However, do not forget why you are looking for the hazards. They may turn into emergencies. Look for the hazards to have time to plan a way out of any emergency. When you see a hazard, think about the emergencies that could develop and figure out what you would do. Also, always be prepared to take action based on your plans. In this way, you will be a prepared, defensive driver who will improve your own safety, as well as the safety of all road users. Whenever you are driving a vehicle and your attention is not on the road, you are putting yourself, your passengers, other vehicles, and pedestrians in danger. Distracted driving can result when you perform any activity that may shift your full attention from the driving task. Taking your eyes off the road or hands off the steering wheel presents obvious driving risks. Mental activities that take your mind away from driving are just as dangerous. Your eyes can gaze at objects in the driving scene, but fail to see them because your attention is distracted elsewhere. Activities that can distract your attention include talking to passengers, adjusting the radio, CD player, or climate controls, eating, drinking, or smoking, reading maps or other literature, picking up something that fell, reading billboards and other road advertisements, watching other people and vehicles including aggressive drivers, talking on a cell phone or CB radio, using telemetric devices such as navigation systems, pagers, etc., daydreaming, or being occupied with other mental distractions. If drivers react a half a second slower because of distractions, crashes double. Some tips to follow so you will not become distracted. Review and be totally familiar with all safety and usage features on any vehicle electronics, including your wireless or cell phone, before you drive. Preprogram radio stations. Preload your favorite CDs or cassette tapes. Clear the vehicle of any unnecessary objects. Review maps and plan your route before you begin driving. Adjust all mirrors for best all-around visibility before you start your trip. Do not attempt to read or write while you drive. Aggressive drivers, road rage, what is it? Aggressive driving and road rage is not a new problem. However, in today's world where heavy and slow-moving traffic and tight schedules are the norm, more and more drivers are taking out their anger and frustration in their vehicles. Crowded roads leave little room for error, leading to suspicion and hostility among drivers and encouraging them to take personally the mistakes of other drivers. Aggressive driving is the act of operating a motor vehicle in a selfish, bold, or pushy manner without regard for the rights or safety of others. Road rage is operating a motor vehicle with the intent of doing harm to others, or physically assaulting a driver or their vehicle. Don't be an aggressive driver. How you feel even before starting your vehicle has a lot to do with how stress affects you while driving. Reduce your stress before and while you drive. Listen to easy listening music. Give the drive your full attention. Do not allow yourself to become distracted by talking on your cell phone, eating, etc. Be realistic about your travel time. Expect delays because of traffic, construction, or bad weather, and make allowances. If you are going to be later than you expected, deal with it. Take a deep breath and accept the delay. Give other drivers the benefit of the doubt. Try to imagine why he or she is driving that way. Whatever their reason, it has nothing to do with you. Slow down and keep your following distance reasonable. Do not drive slowly in the left lane of traffic. Avoid gestures. Keep your hands on the wheel. Avoid making any gestures that might anger another driver, even seemingly harmless expressions of irritation like shaking your head. Be a cautious and courteous driver. If another driver seems eager to get in front of you say, "Be my guest." This response will soon become a habit, and you will not be as offended by other drivers' actions. What you should do when confronted by an aggressive driver. First and foremost, make every attempt to get out of their way. Put your pride in the backseat. Do not challenge them by speeding up and attempting to hold your own in your travel lane. Avoid eye contact. Ignore gestures and refuse to react to them. Report aggressive drivers to the appropriate authorities by providing a vehicle description, license number, location and, if possible, direction of travel. If you have a cell phone and can do it safely, call the police. If an aggressive driver is involved in a crash farther down the road, stop a safe distance from the crash scene, wait for the police to arrive, and report the driving behavior that you witnessed. Driver factors. Vision. People cannot see as sharply at night or in dim light. Also, their eyes need time to adjust to seeing in dim light. Most people have noticed this when walking into a dark movie theater. Glare. Drivers can be blinded for a short time by bright light. It takes time to recover from this blindness. Older drivers are especially bothered by glare. Most people have been temporarily blinded by camera flash units or by the high beams of an oncoming vehicle. It can take several seconds to recover from glare. Even two seconds of glare blindness can be dangerous. A vehicle going 55 miles per hour will travel more than half the distance of a football field during that time. Do not look directly at the bright lights when driving. Look at the right side of the road. Watch the sideline when someone coming towards you has very bright lights on. Fatigue and lack of alertness. Fatigue, being tired, and lack of alertness are bigger problems at night. The body's need for sleep is beyond a person's control. Most people are less alert at night, especially after midnight. This is particularly true if you have been driving for a long time. Drivers may not see hazards as soon or react as quickly, so the chance of a crash is greater. If you are sleepy, the only safe cure is to get off the road and get some sleep. If you do not, you risk your life and the lives of others. Roadway factors. Poor lighting. In the daytime, there's usually enough light to see well. This is not true at night. Some areas may have bright streetlights, but many areas will have poor lighting. On most roads, you'll probably have to depend entirely on your headlights. Less light means you will not be able to see hazards as well as in daytime. Road users who do not have lights are hard to see. There are many accidents at night involving pedestrians, joggers, bicyclists, and animals. Even when there are lights, the road scene can be confusing. Traffic signals and hazards can be hard to see against a background of signs, shop windows, and other lights. Drive slower when lighting is poor or confusing. Drive slowly enough to be sure you can stop in the distance you can see ahead. Drunk drivers. Drunk drivers and drivers under the influence of drugs are a hazard to themselves and you. Be especially alert around the closing times for bars and taverns. Watch for drivers who have trouble staying in their lane or maintaining speed, who stop without reason, or show other signs of being under the influence of alcohol or drugs. Vehicle factors. Headlights. At night, your headlights will usually be the main source of light for you to see by and for others to see you. You cannot see nearly as much with your headlights as you see in the daytime. With low beams, you can see ahead about 250 feet, and with high beams about 350 to 500 feet. You must adjust your speed to keep your stopping distance within your sight distance. This means going slowly enough to be able to stop within the range of your headlights. Otherwise, by the time you see a hazard, you'll not have enough time to stop. Night driving can be more dangerous if you have problems with your headlights. Dirty headlights may give you only half the light they should. This cuts down your ability to see and makes it harder for others to see you. Make sure your lights are clean and working. Headlights can be out of adjustment if they do not point in the right direction. They will not give you a good view, and they can blind other drivers. Have a qualified person make sure they are adjusted properly. Other lights. In order for you to be seen easily, the following must be clean and working properly, reflectors, marker lights, clearance lights, taillights, identification lights. Turn signals and brake lights. At night, your turn signals and brake lights are even more important for telling other drivers what you intend to do. Make sure you have clean, working turn signals and stop lights. Windshields and mirrors. It is more important at night than in the daytime to have a clean windshield and clean mirrors. Bright lights at night can cause dirt on your windshield or mirrors to create a glare of its own, blocking your view. Most people have experienced driving towards the sun just as it has risen or is about to set, and found that they can barely see through a windshield that seemed to look okay in the middle of the day. Clean your windshield on the inside and outside for safe driving at night. Night driving procedures. Pre-trip procedures. Make sure you are rested and alert. If you are drowsy, sleep before you drive. Even a nap can save your life or the lives of others. If you wear eyeglasses, make sure they are clean and unscratched. Don't wear sunglasses at night. Do a complete pre-trip inspection of your vehicle. Pay attention to checking all lights and reflectors, and cleaning those you can reach. Avoid blinding others. Glare from your headlights can cause problems for drivers coming toward you. They can also bother drivers going in the same direction you are when your lights shine in their rearview mirrors. Dim your lights before they cause glare for other drivers. Dim your lights within 500 feet of an oncoming vehicle, and when following another vehicle within 500 feet. Avoid glare from oncoming vehicles. Do not look directly at lights or oncoming vehicles. Look slightly to the right at a right lane or edge marking if available. If other drivers do not put their low beams on, do not try to get back at them by putting your own high beams on. This increases glare for oncoming drivers and increases the chance of a crash. Use high beams when you can. Some drivers make the mistake of always using low beams. This seriously cuts down on their ability to see ahead. Use high beams when it's safe and legal to do so. Use them when you are not within 500 feet of an approaching vehicle. Also, do not let the inside of your cab get too bright. This makes it harder to see outside. Keep the interior light off, and adjust your instrument lights as low as you can to still be able to read the gauges. If you get sleepy, stop driving at the nearest safe place. People often do not realize how close they are to falling asleep, even when their eyelids are falling shut. If you can safely do so, look at yourself in a mirror. If you look sleepy or you just feel sleepy, stop driving. You are in a very dangerous condition. The only safe cure is to sleep. Driving in fog. Fog can occur at any time. Fog on highways can be extremely dangerous. Fog is often unexpected, and visibility can deteriorate rapidly. You should watch for foggy conditions and be ready to reduce your speed. Do not assume that the fog will thin out after you enter it. The best advice for driving in fog is do not. It is preferable that you pull off the road into a rest area or truck stop until visibility is better. If you must drive, be sure to consider the following. Obey all fog-related warning signs. Slow down before you enter fog. Use low-beam headlights and fog lights for best visibility even in daytime, and be alert for other drivers who may have forgotten to turn on their lights. Watch for vehicles on the side of the roadway. Seeing taillights or headlights in front of you may not be a true indication of where the road is ahead of you. The vehicle may not be on the road at all. Use roadside highway reflectors as guides to determine how the road may curve ahead of you. Listen for traffic you cannot see. Avoid passing other vehicles. Do not stop along the side of the road, unless absolutely necessary. Vehicle checks. Make sure your vehicle is ready before driving in winter weather. You should make a regular pre-trip inspection, paying extra attention to the following items. Coolant level and antifreeze amount. Make sure the cooling system is full and there is enough antifreeze in the system to protect against freezing. This can be checked with a special coolant tester. Defrosting and heating equipment. Make sure the defrosters work. They are needed for safe driving. Make sure the heater is working and that you know how to operate it. If you use other heaters and expect to need them, such as mirror heaters, battery box heaters, fuel tank heaters, check their operation. Wipers and washers. Make sure the windshield wiper blades are in good condition. Make sure the wiper blades press against the window hard enough to wipe the windshield clean, otherwise they may not sweep off snow properly. Make sure the windshield washer works and there is washing fluid in the washer reservoir. Use windshield washer antifreeze to prevent freezing of the washer liquid. If you cannot see well enough while driving, for example, if your wipers fail, stop safely and fix the problem. Tires. Make sure you have enough tread on your tires. The drive tires must provide traction to push the rig over wet pavement and through snow. The steering tires must have traction to steer the vehicle. Enough tread is especially important in winter conditions. You must have at least 4/32 of an inch tread depth in every major groove on your front tires and at least 2/32-inch on other tires. More would be better. Use a gauge to determine if you have enough tread for safe driving. Tire chains. You may find yourself in conditions where you can't drive without chains, even to get to a place of safety. Carry the right number of chains and extra cross-links. Make sure they will fit your drive tires. Check the chains for broken hooks, worn or broken cross-links, and bent or broken side chains. Learn how to put the chains on before you need to do it in snow and ice. Lights and reflectors. Make sure the lights and reflectors are clean. Lights and reflectors are especially important during bad weather. Check from time to time during bad weather to make sure they are clean and working properly. Windows and mirrors. Remove any ice, snow, etc. from the windshield, windows, and mirrors before starting. Use a windshield scraper, snow brush, and windshield defroster as necessary. Handholds, steps, and deck plates. Remove all ice and snow from handholds, steps, and deck plates. This will reduce the danger of slipping. Radiator shutters and winter front. Remove ice from the radiator shutters. Make sure the winter front is not closed too tightly. If the shutters freeze shut or the winter front is closed too much, the engine may overheat and stop. Exhaust system. Exhaust system leaks are especially dangerous when cab ventilation may be poor, windows rolled up, etc. Loose connections could permit poisonous carbon monoxide to leak into your vehicle. Carbon monoxide gas will cause you to be sleepy. In large enough amounts, it can kill you. Check the exhaust system for loose parts and for sounds and signs of leaks. Driving. Slippery surfaces. Drive slowly and smoothly on slippery roads. If it is very slippery, you should not drive at all. Stop at the first safe place. Start gently and slowly. When first starting, get the feel of the road. Do not hurry. Adjust turning and braking to conditions. Make turns as gently as possible. Do not brake any harder than necessary, and do not use the engine brake or speed retarder. They can cause the driving wheels to skid on slippery surfaces. Adjust speed to conditions. Do not pass slower vehicles unless necessary. Go slowly and watch far enough ahead to keep a steady speed. Avoid having to slow down and speed up. Take curves at slower speeds, and do not brake while in curves. Be aware that as the temperature rises to the point when ice begins to melt, the road becomes even more slippery. Slow down more. Adjust space to conditions. Do not drive alongside other vehicles. Keep a longer following distance. When you see a traffic jam ahead, slow down or stop to wait for it to clear. Try hard to anticipate stops early and slow down gradually. Watch for snowplows, as well as salt and sand trucks, and give them plenty of room. Wet brakes. When driving in heavy rain or deep standing water, your brakes will get wet. Water in the brakes can cause the brakes to be weak, to apply unevenly, or to grab. This can cause lack of braking power, wheel lockups, pulling to one side or the other, and jackknife if you pull a trailer. Avoid driving through deep puddles or flowing water if possible. If not, you should slow down and place transmission in a low gear. Gently put on the brakes. This presses linings against brake drums or discs and keeps mud, silt, sand, and water from getting in. When out of the water, maintain light pressure on the brakes for a short distance to heat them up and dry them out. Make a test stop when safe to do so. Check behind to make sure no one is following, then apply the brakes to be sure they work well. If not, dry them out further as described above. Caution, do not apply too much brake pressure and accelerator at the same time, or you can overheat brake drums and linings. Vehicle checks. Do a normal pre-trip inspection, but pay special attention to the following items. Tires. Check the tire mounting and air pressure. Inspect the tires every two hours or every 100 miles when driving in very hot weather. Air pressure increases with temperature. Do not let air out or the pressure will be too low when the tires cool off. If a tire is too hot to touch, remain stopped until the tires cool off. Otherwise, the tire may blow out or catch fire. Engine oil. The engine oil helps keep the engine cool, as well as lubricating it. Make sure there is enough engine oil. If you have an oil temperature gauge, make sure the temperature is within the proper range while you are driving. Engine coolant. Before starting out, make sure the engine cooling system has enough water and antifreeze according to the engine manufacturer's directions. Antifreeze helps the engine under hot conditions, as well as cold conditions. When driving, check the water temperature or coolant temperature gauge from time to time. Make sure that it remains in the normal range. If the gauge goes above the highest safe temperature, there may be something wrong that could lead to engine failure and possible fire. Stop driving as soon as safely possible and try to find out what is wrong. Some vehicles have sight glasses, see-through coolant overflow containers, or coolant recovery containers. These permit you to check the coolant level while the engine is hot. If the container is not part of the pressurized system, the cap can be safely removed and coolant added even when the engine is at operating temperature. Never remove the radiator cap or any part of the pressurized system until the system has cooled. Steam and boiling water can spray under pressure and cause severe burns. If you can touch the radiator cap with your bare hand, it is probably cool enough to open. If coolant has to be added to a system without a recovery tank or overflow tank, follow these steps. Shut engine off. Wait until engine has cooled. Protect hands, use gloves or a thick cloth. Turn radiator cap slowly to the first stop, which releases the pressure seal. Step back while pressure is releasing from cooling system. When all pressure has been released, press down on the cap and turn it further to remove it. Visually check level of coolant and add more coolant if necessary. Visually check level of the coolant and add more coolant if necessary. Replace cap, turn all the way to the closed position. Engine belts. Learn how to check v-belt tightness on your vehicle by pressing on the belt. Loose belts will not turn the water pump and/or fan properly. This will result in overheating. Also, check belts for cracking or other signs of wear. Hoses. Make sure coolant hoses are in good condition. A broken hose while driving can lead to engine failure and even fire. Driving. Watch for bleeding tar. Tar in the road pavement frequently rises to the surface in very hot weather. Spots where tar bleeds to the surface are very slippery. Go slowly enough to prevent overheating. High speeds create more heat for tires and the engine. In desert conditions, the heat may build up to the point where it is dangerous. The heat will increase chances of tire failure or even fire and engine failure.